Over the past decade, more and more people in nearly every age group, financial bracket, and circumstance across the country have reported worrying symptoms. They’re losing interest in life, lacking zest for learning new things, and finding that activities they previously enjoyed feel meaningless. Based on eight years of data from more than 600,000 people across the US, the researchers discovered that more young people — particularly those in their early 20s — are going through sustained periods in which they’re losing interest in life and leisure activities, at rates much higher than that same age group did just a decade ago. 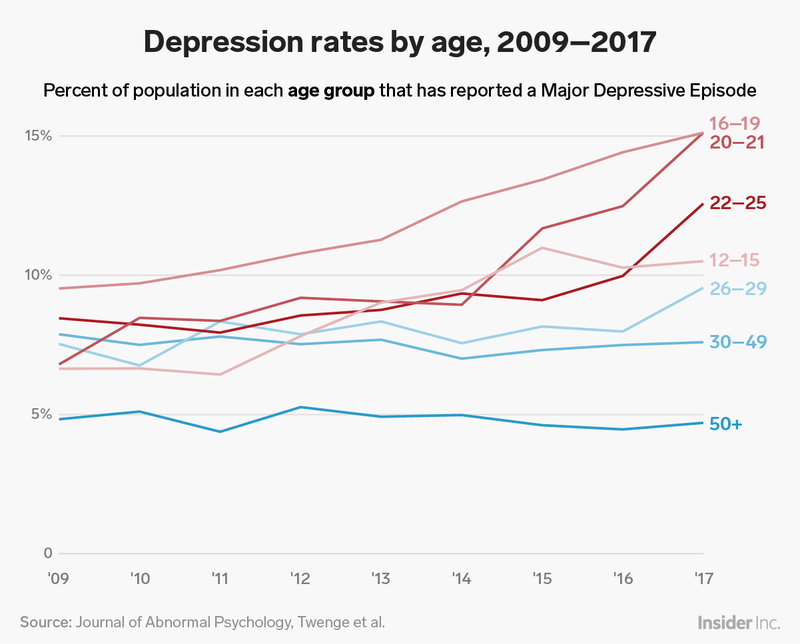 The graph below charts depression trends from a nationwide, anonymous survey that asks participants some straightforward questions about their mental health. (The survey is designed to gain information about people’s drug and alcohol use.) The data clearly shows depression rates soaring among kids as young as 12 and young adults up to 25. Lead study author Jean Twenge, who wrote the book “iGen,” told Business Insider that these trends shouldn’t be dismissed as unavoidable generational shifts. Depression is common: The World Health Organization estimates that on any given day, more than one in every 20 Americans is depressed. A major depressive episode isn’t just a single bad day; rather, psychologists define it as a sustained loss of interest or lack of pleasure in life that affects a person’s regular routines and day-to-day functioning for two weeks or more. “When followed into adulthood, those with adolescent-onset depression (compared to those without) are twice as likely to have a major depressive episode, five times more likely to attempt suicide, and are at increased risk for death by suicide,” the study authors wrote. A second study she authored, published Wednesday in the Journal of Social and Personal Relationships, examined four decades of surveys about how young people spend their time. The results showed that high-school seniors today spend a full hour less socializing in person than teens in the late ’80s did. High-school sophomores aren’t partying like they used to either; they attend 17 fewer parties than the sophomores of the ’80s did. That’s not because today’s kids are diligently doing more homework or spending more time on extracurricular activities. The extra time away from friends and peers is eaten up by screens, Twenge said. Her findings suggest that as teens spend more time alone on their devices, they’re getting lonelier and feeling more left out. A wealth of studies shows that from day one, human gaze is a crucial ingredient in social interaction. Having high-quality, positive social interactions with family and friends regularly can lower a person’s risk of depression. 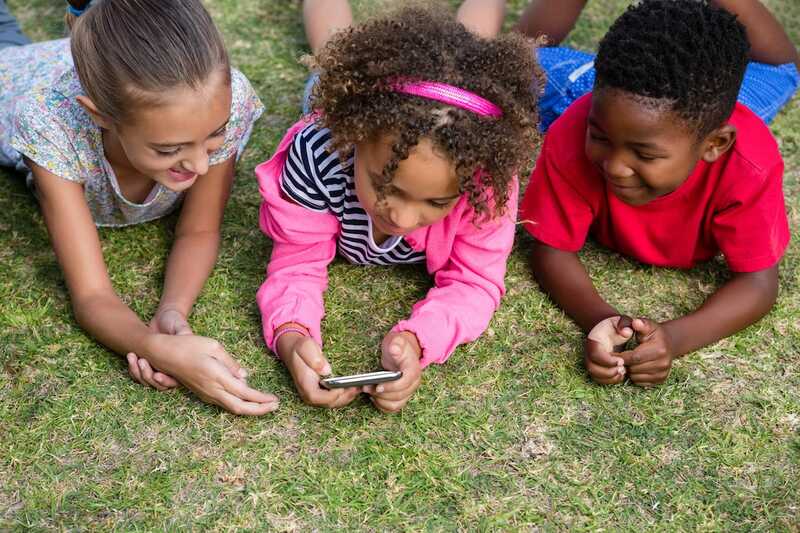 Research about the effects of screen time is still new, but some early data suggests that replacing a kid’s early social interactions with more time on devices may hurt their development of emotional understanding and empathy. Screen time can also make it harder to sleep through the night than outdoor playtime. Although only a trained mental-health professional can diagnose depression or suicide risk, there’s more everyone can do to help each other out. Asking your peers, family, friends, and kids how they’re doing — and really listening to their answers without judgment — is a simple first step. This entry was posted in Uncategorized on March 21, 2019 by Truth2Freedom.